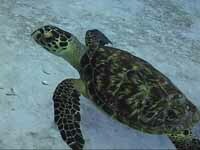 The Cayman Islands were first sighted by Christopher Columbus in 1503 on his last voyage to the New World, when he named them Las Tortugas ("The Islands of the Turtles"), for all of the sea turtles that surround the islands. 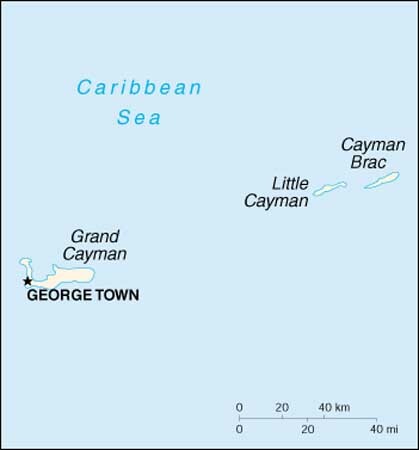 The Caymans are located in the Caribbean Sea, and are made up of Grand Cayman (main tourist island - located 150 miles Southwest of Cuba, and 150 miles Northwest of Jamaica), Cayman Brac and Little Cayman (pristine nature preserves and diving - located 89 miles Northeast of Grand Cayman, separated by a seven mile-wide channel). Grand Cayman is roughly 22 miles long and seven miles wide, while Little Cayman and Cayman Brac are about 10-12 miles long and 1 mile wide. The Cayman Islands are located in the Eastern Standard Time (EST) zone, and do not observe daylight savings time. The local language of the Cayman's is English. The islands are the limestone outcroppings of an underwater mountain range called the Cayman Ridge. The islands have around 250 dive sites lavished with a plentitude of colorful fish, rays (Eagle and Sting), sea turtles, amazing wall diving, wrecks, beautiful coral reefs, and excellent visibility. The coral reefs offer magnificent black coral, along with a variety of sponges (giant barrel, elephant ear), and exciting swim-throughs. The Caymans are tempered by tradewinds that create a tropical climate with average air temperatures around 80 F. Average water temperatures range from 76F to 80F, and water visibility varies around 130 ft most days, with better visibility in the sister islands. When traveling to the Caymans, you will fly into either the Owen Robert International Airport on Grand Cayman, or some providers offer direct flights to Cayman Brac. Island Air and Cayman Airways have express flights to the two sister islands from Grand Cayman. The Caymans are serviced by the following airlines from various major cities around the world Air Jamaica, American Airlines, British Airways, Cayman Airways, Delta, Northwest Airlines, and US Airways. There is no ferry service available between the islands. Taxis are available at the airport and all resorts, and generally have fixed rates to precise locations. In the alternative, you may choose to rent a car while in the Cayman's. When traveling by car in the Caymans, you will drive on the left hand side of the road. To rent a car, a valid national or international (English Language) driver's license is needed. If the driver's license is not in the English language, the visitor must carry a translation with the license. The rental company will issue a permit for the time that you are on the island at a rate of $7.50 (US). Some rental companies also have a minimum driver age of 21. Please note that a seat belt law is in effect which applies to every person in the vehicle including children. When entering/exiting the Caymans, proof of citizenship is required (i.e. valid Passport) along with a return ticket. A passport is preferred but U.S., British, and Canadian citizens may use a certified, original birth certificate (with a raised seal), and a driver's license (as a photo ID). All travelers should have a round-trip or onward ticket. For Specific Questions regarding entry into the Cayman Islands, please contact the Cayman Islands Department of Immigration at (345) 949-8052. Upon arrival, you will be issued a pink Immigration slip. You must redeem this slip with your other travel documents when departing. There is a $25.00 (US) departure tax for the Cayman Islands that is included in the price of your airline ticket. Cayman's local currency has a basic unit of a dollar, and is issued in notes with denominations of CI$100, 50, 25, 10, 5 and 1, with coins valued at 25 cents, 10, 5 and 1 cent. The CI dollar has a fixed exchange rate with the US dollar of CI$1.00 equals US$1.25. There is no need to exchange US dollars for Cayman currency, as they are widely accepted throughout the islands. The most commonly accepted credit cards are American Express, Diners Club, MasterCard, Visa and their affiliates. Should you be using travelers checks during your stay in the Caymans, know that you will incur a 10% tax for cashing them in. Banks in the Caymans are normally open Mon. - Thurs 9.00 am to 4:00 pm, and Fri. from 9:00 a.m. to 4:30 p.m. Automatic Teller Machines (ATM) accepting VISA and MasterCard with Cirrus affiliation can be located at the Cayman National Bank, other larger banks, and at Owen Roberts International Airport. The Cayman Islands have a modern telephone system which enables you to make local calls, long distance within the Caymans, and International Direct Dialing (IDD). The area code for the Cayman Islands is (345). While visiting the islands, you may choose to purchase a pre-paid phone card, which is available in values of CI$10, $15 and $30. These phone cards can be purchased at the Cable and Wire main office located in Anderson Square in George Town (Grand Cayman), or at the Cayman Brac post office and most services stations. Mobile phones are available for rent, or with prior set-up you could bring your own mobile phone with you. Cayman's mobile network is compatible with 800MHz Analogue or TDMA digital networks. Please contact your telecommunications carrier for activating international roaming while you are visiting the Cayman Islands. The electrical current in the Cayman Islands is 110 volts, 60 cycles AC and compatible with American appliances. There are no suggested inoculations needed to enter the Caymans, as they have a very high standard of hygiene, and very safe food and drinking water. However when traveling from an area know to be infected with Yellow Fever or Cholera, a vaccination certificate is required for travelers over I year of age. For more information on traveling abroad, and possible health risks, contact the Center for Disease Control in the US. Grand Cayman Hospitals (open 24 hours a day): George Town Hospital & Hyperbaric Facility (345) 949 - 8600 (Hyperbaric ext. 2795), and Chrissie Tomlinson (345) 949 - 6066. Most shops in the Cayman Islands are open Mon. - Sat. 9:00 a.m. - 5:00 p.m. When shopping in the islands, avoid buying any black coral, or items made from the shell of the sea turtles as they are endangered species. Furthermore, customs officials in many countries will seize such items when not accompanied by a proper permit.